Celebrating one year in business !! 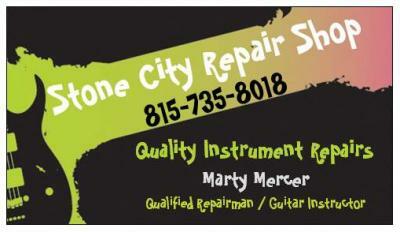 If you're tired of the guy (at the guitar store) changing your strings and calling it a set up, then I'm your guy !. Countless numbers of my clients have had horror stories to tell. I do my best to make sure the nightmare ends here. I see clients one at a time, by appointment only. This ensures uninterrupted attention to your needs without the typical distractions of the loud music stores. Your guitar is handled by myself and no one else. There are none of the typical worries of dropping your guitar off at some store and the countless things that can and HAVE happened. **TURN AROUND TIME** Always a big issue! I do my best to turn around repairs as quickly as possible without compromising quality of work. If you need it done now, call me now. Electric guitar / bass set ups $35.00 + STRINGS. intonation, tighten all things loose, condition fingerboard if needed. $20.00 minimum charge to diagnose electrical problems. All other electronic work is billed by the hour at a rate of $25.00 p/hr. SPECIFIC REPAIR IN THIS LIST. Also, I teach guitar lessons. Rates are $25.00 per hour. From the complete novice, to the advanced player looking to learn something new. Lessons catered to YOU !